There are a number of nice camping choices in the western half of the Upper Peninsula. Primarily we'll review and profile campgrounds within our direct experience. Some are included here because they are suitable overnight stops for the circle tour traveler. Others also have special features that are worth spending a few additional hours or a few days to enjoy them. 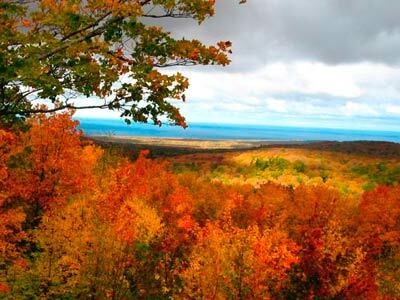 Located on Lake Superior, the Porkies offer 35,000 acres of premier hiking, backcountry camping, waterfalls, and scenic beauty. The Union Bay campground is on the lake and offers 100 camp sites with modern facilities - showers, hookups, dump station and boat launch. More rustic camping facilities are available at Presque Isle Park and sprinkled along the South Boundary Road. Another camping option for the Porkies is Big Bear Union River Campground, near the entrance to the park. Recently re-opened it has 50 campsites, all with electrical power and some with upgraded utilities. Walking distance to the beach and to the Porkies visitor center. The Harbor's campground is located on a high bluff above Lake Superior. Forty nicely spaced wooded camp sites with picnic tables, level tent pads and adequate parking for RVs. This national forest campground formerly was semi-modern with running water bathrooms and a dump station but these amenities had to be removed for environmental and budgetary reasons. It is now served by two new clean and comfortable vault toilets at either end of the campground loops and water hydrants for potable water. There are no electric hookups. The small convenience store at the harbor has re-opened on weekends and some weekday evenings. The pavilion near the picnic area and boat harbor has running water bathrooms and is open during the main summer season. One of our favorite spots for rock picking, agate hunting, hiking and scenic beauty of the waterfalls and surrounding area. 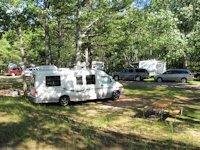 This camping area is run by Gogebic County and is located on Lake Superior a few miles east of the Wisconsin-Michigan border. Most sites have lake views and electric service. There is running water in the washrooms, but no showers. A favorite spot for rock hounds. We've found a few agates there and met people on the beach who have had very good luck here. Has a nice picnic ground; day visit price is reasonable ($2.00) and 2011 camping fees ranged from $14 to $22. Sites may be reserved by calling 906-932-1913 after May 3rd or 906-663-4687 before May 3rd. This camping area is actually in Wisconsin about 8 miles east of Little Girls Point. Run by Iron County and and located on Lake Superior on County Highway A just off of State Highway 122. Most sites are level and have at least some gravel on the parking pads. There is running water in the washrooms and showers ($1 for 4 minutes). A swimming beach nearby and a decent rock picking beach. The washroom building has a nice screened in porch with several picnic tables. Attractive play area for the kids. 2015 camping fees were $15 to $20. Sites may be reserved by calling (715) 893-2370. Note: this campground near popular ATV trails. This park occupies an isthmus between Lake Fanny Hooe and Lake Superior. All of the facilities face Fanny Hoe but there are hiking trails and scenic overlooks of Lake Superior. The park service also operates tours of the historic Copper Harbor Lighthouse complex and manages the Fort Wilkens Historic preservation exhibit that occupies the center of the park. 165 camp sites, electric hookups, and modern washrooms with showers. It is a great family campground. Near enough to Copper Harbor and its attractions but far enough away that the kids have lots of room to run around. For RVers, one of the two campgrounds is laid out with pull-throughs for large units (and is largely populated by an adult population). If Fort Williams is full, consider nearby Lake Fanny Hooe Resort & Campground. We've stayed there a few times and have been satisfied with the maintenance and service. A plus is that it's within walking distance of downtown Copper Harbor. We discovered this well organized, very clean and fully paved RV park in 2006 and have been back a few times since. It faces the Portage Waterway and is within walking distance to downtown Houghton, yet sufficiently isolated for security and comfort. 24 sites, each with a covered patio with a picnic table, BBQ grill, fire ring and full hookups - water, sewer, and electric. Limited Wi-Fi service. Adjacent to city swimming beach, pavilion and boat launch. Internet service. Across the waterway is the municipal campground of Hancock. It is not near as nice as Houghton's park but it does offer tent sites as well as RV hookups. McClain is located about 20 miles west of Hancock on Lake Superior near the western end of the Portage Canal. Scenic views, beautiful sand beaches, and a cooling night breeze off Lake Superior are among the features that make FJ McClain one of the more popular Upper Peninsula parks. All 98 campsites have electrical service. Reservations are recommended for July and August as well as September weekends. Go Here for a park map. This park is located on Highway 26 midway between Copper Harbor and the Porcupine Mountains near the town of Toivola. 62 camp sites with electric service and modern washrooms with showers. This is a very convenient overnight stay for the Circle Tour traveler who finds themselves between the Porkies and the Keweenaw. There's a nice playground, picnic area, swimming beach and a nature trail. This park is located on the southern edge of the town of Baraga on US Highway 41, about 20 miles south of Houghton, Mi. It overlooks Lake Superior's L'Anse Bay. Highway 26 midway between Copper Harbor and the Porcupine Mountains near the town of Toivola. 116 modern camp sites with electric service and modern washrooms with showers. This is a very convenient overnight stay for the Circle Tour traveler who is traveling between Marquette and the Keweenaw Peninsula. 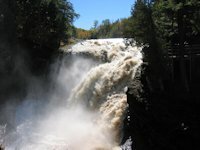 It is also convenient for travelers staying in the area for a few days to enjoy the area waterfalls and hiking in the Huron Mountains. If this park is full, there is a waterfront campground across the bay operated by the village of L'Anse. 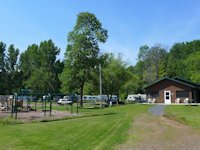 Located about 25 miles west of Marquette on US Highway 41, Van Riper is a convenient overnight stay. Its primary appeal is to fishing and watersports enthusiasts who recreate on Lake Michigamme. But for the traveler it offers modern facilities with showers and 147 sites with electric service. There is also a 40 unit rustic campground and a park store. One summer weekend evening traveling through this area we found Van Riper full but found a private campground a few miles west with a few vacancies. 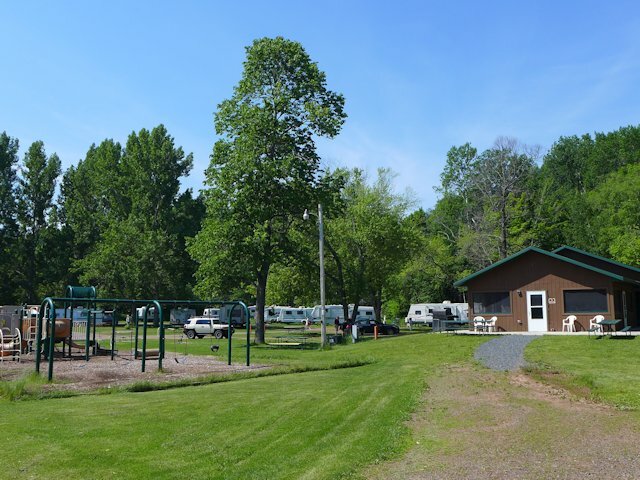 We found Michigamme Shores campground adequate and fairly priced.